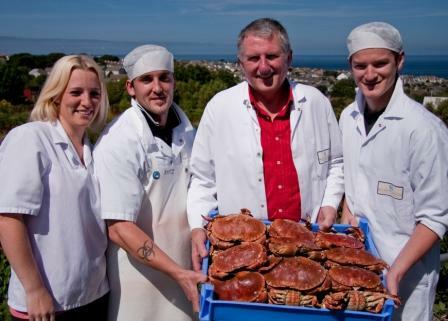 Family run seafood specialist supplier Matthew Stevens & Son has extended its factory overlooking St Ives bay to accommodate a new crab processing facility, creating an extra ten local jobs. Establishing this new facility has meant that Matthew Stevens & Son is now able to produce its own high quality white and brown crab meat, as well as supply crab for its crab cakes. By carefully hand picking the crab meat in the traditional way and not using machinery, the company is able to provide crab meat of the highest standard. Richard Button and his wife Charlene (who relocated their family to St Ives from Newlyn), together with Jacob Billinger, with over 30 years combined Shellfish experience, have been recruited to head up the new unit.